Are you tired of dealing with issues with your home in Meredith, NH? Or maybe you’ve finally run into a problem that you can’t fix and you’re not sure who to trust to help you out. At Rowell’s Services, we have many happy customers in Meredith. In fact, there are people there who never call anyone else to help out when something goes wrong with their homes. Whether you need help with your plumbing, heating, air conditioning or electrical systems, we are here for you. We have certified, friendly technicians who would love to come out and help you get everything in your home running again, just the way you need it to. We’ll make sure that we get you the best deal we can on your repair or on anything you purchase through us. We’ll also help you get everything installed in a way that you love, so you can enjoy living in your home again. While we will fix anything that breaks in the above areas, many of our calls in Meredithare about the following issues. Winter is coming, so it’s time to turn off your air conditioner and make sure that your heater is working well. If it’s not, give us a call and we’ll come fast. Because we live and work near Meredith, we know exactly how cold it gets here. That’s why we make every effort to repair your heater quickly, so you and your pipes don’t freeze! Sometimes, we’ll come out to perform a repair only to find that it’s in your best interests to replace your furnace, rather than to fix it. If this happens, we’ll let you know and we’ll help you come up with a plan to replace it. We’ll even suggest furnaces that fit the size of your house, your budget, and your energy efficiency needs, then install them once you’re ready. Pretty soon, your heat will be on again and you won’t have to worry anymore! We perform all of the same services for air conditioning, too. If you ever find that you have any HVAC installation and repair needs, let us know and we’ll get everything taken care of fast, so you can get comfortable again. A lot of people in the areas surrounding Meredith are on septic tanks rather than the sewer system. Our plumbers are experts in both, so they can come to you and figure out what has gone wrong with your septic tank and get it working again soon. Many times, your septic tank will simply need to be pumped out in order for the system to run well again. In fact, septic tanks should be pumped out regularly. The exact interval will be determined by the size of the tank, its age, and how much waste you are regularly pumping into it. We can help you figure this out if you don’t know it already. We can also help determine how full your tank is and get you on the schedule for septic tank pumping if it’s getting close. This can keep you from having problems that can run from annoying to catastrophic. When your drains stop up, it’s usually time to call a plumber. We will do whatever it takes to get yours cleaned out, whether that means running a plumbing snake down your drain or hydro-jetting your sewer. When we first come out, we’ll talk to you about your clogged drain or drains. One clog usually means that we can take care of the problem with a plumbing snake, though the issue may lie deeper in your system than that. Several clogged drains usually mean finding a deeper clog. When they’re all clogged, that’s when we start to check out your sewer. The prospect of sewer repairs can sound daunting even to an experienced homeowner, but they don’t have to be difficult. In fact, we can usually fix your sewer in a day or so, so you aren’t without plumbing functionality for long. We can often even replace any concrete that we dig up on that same day, so you don’t have a gaping hole in your walkway or your driveway. Many times, we can perform trenchless sewer repair, working through your indoor sewer access point to get the repair done. 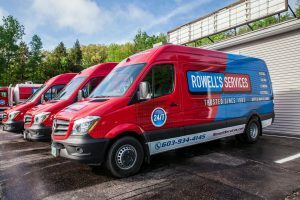 No matter what you need to have done with the plumbing, HVAC system, or electricity in your home, call us at Rowell’s and we’ll take care of you.